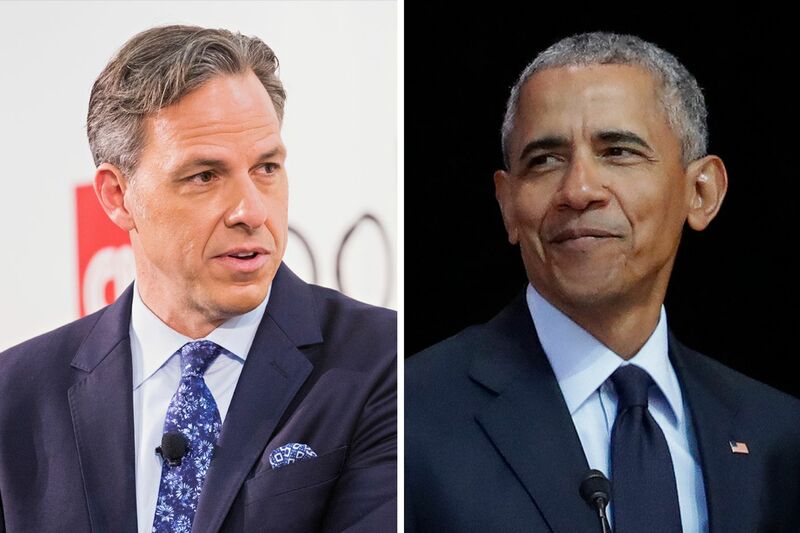 CNN host Jake Tapper (left) took a swipe at former president Barack Obama over the current standing of the Democratic party. These days, Jake Tapper is usually forced to deal with angry Trump supporters over his reporting and criticism of the president. But on Sunday, it was Democrats who were riled up by Tapper over a tweet mocking former President Barack Obama. Tapper, a Philadelphia native who hosts both The Lead and State of the Union for the network, used an appearance of the former first couple at a Beyonce and Jay-Z concert in Landover, Md., on Saturday night to point out the historic decline in the number of Democrats holding office during his presidency. "The Democratic Party is the weakest it has been since the 1920s," wrote Tapper, in response to HuffPost's story of the Obamas' appearance Saturday night. Tapper's tweet quickly went viral Sunday afternoon, garnering over 9,000 replies and over 8,000 likes as of Monday morning. Most of the replies were from Democrats angry over Tapper's remarks, to which he responded in a subsequent tweet. "Glad he's enjoying his life; he's entitled. Also, FYI, as we begin focus on Nov 2018 and 2020, he presided over a historically precipitous decline of his party," Tapper responded. "Some Dems seem angrier at my tweet than at that fact." Back in June, Tapper's CNN colleague Fareed Zakaria made a similar point on Fareed Zakaria GPS, noting that during both of Obama's two terms as president, Republicans made substantial political gains everywhere outside of the White House. "Unless Democrats face up to this reality and devise a strategy to reverse this tidal wave of defeat, they might find themselves surprised one more time this November," Zakaria said. "When you tally up their representation in Congress, state legislatures and governorships, the Democrats almost have their lowest representation in about 100 years." Zakaria was basing his comments on analysis of data from both Real Clear Politics and FiveThirtyEight, and Politifact rated Zakaria's claim as "true" in an analysis done last month. "Democrats wield less power than Republicans in each of these offices. In the 1920s, they had an even weaker standing relative to the GOP than they do today," Politifact's John Kruzel wrote. "But Zakaria hedged his bets by saying Democrats almost have their lowest representation in about 100 years — and the numbers appear to back him up." From 2008 to 2016, Democrats lost more than 1,000 elected offices, including congressional and state legislative seats and governorships. They also lost the presidency, as Obama-endorsed Hillary Clinton was unable to defeat businessman and reality TV star Donald Trump. Despite that, Democrats are increasingly optimistic that a blue wave in the upcoming midterm elections will force out many vulnerable Republicans lawmakers. According to the Cook Political Report, Democrats are "substantial favorites" to take control of the House, and some experts say control of the Senate could be within reach, despite facing a map that heavily favors Republicans. "We know the wind is going to be in our face," Senate Republican leader Mitch McConnell told reporters back in April. "We don't know whether it's going to be a Category 3, 4, or 5." Obama has largely remained out of the spotlight since exiting the White House in 2017, and has been reluctant to publicly engage or criticize his successor. Earlier his month, in a speech delivered in South Africa to celebrate the 100th anniversary of Nelson Mandela's birth, Obama offered his toughest words yet about Trump without naming him directly. "Politicians have always lied, but it used to be if you caught them lying, they'd be like, 'Aw, man,' " Obama said. "But now if you catch them lying, they'll just keep on lying!"